Finally, Plextor’s M6e SSD—one of the first PCI-E solid-state drives—is getting a successor. But it’s not the Plextor M7e, as you might expect. That drive was quietly killed this summer. Instead, Plextor will reveal the M8Pe at CES 2016, a M.2 solid-state drive loaded with all the latest and greatest storage technologies. The M8Pe features a 4x PCIe 3.0 connection and the insanely fast NVMe protocol, promising 4 kilobyte random reads up to 270,000 Input/Output operations per second (IOPS), and 4KB write up to 150,000 IOPS. The increasingly popular M.2 form factor allows for better airflow and cooling, as well as a performance bump, though Plextor isn’t spilling the beans on expected read/write speeds just yet. 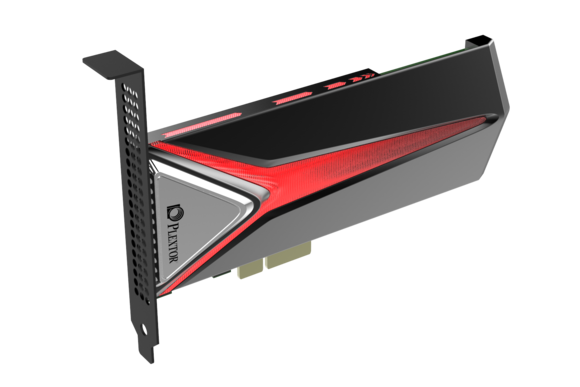 Plextor says the drive—its first NVMe SSD—is perfect for gamers and others who need high performance from their SSDs. Why this matters: It’s great to see Plextor come out with a PCIe drive after the M7e ended with a whimper. That drive was rumored to be canceled because it couldn’t compete with similar drives from Samsung. The M7e used PCIe 2.0, for example, whileSamsung’s 950 Pro M.2 was rocking PCIe 3.0 and the NVMe protocol. Now packed with all the latest storage technologies, Plextor’s M8Pe SSD looks loaded down and ready to compete.